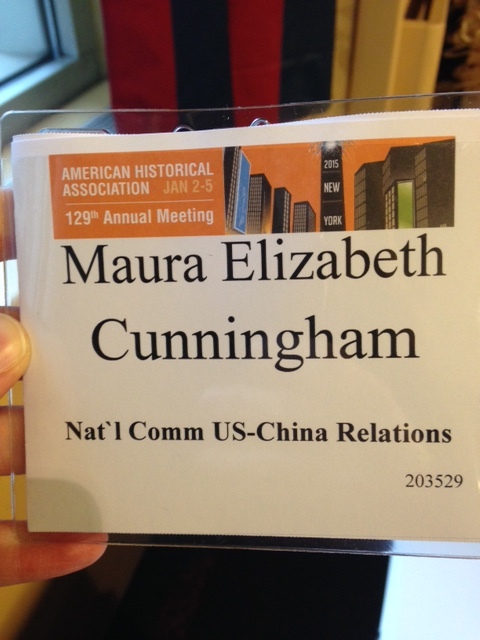 The annual meeting of the American Historical Association was held in New York this past weekend. Admittedly, I didn’t have a specific reason to go—I wasn’t on a panel or interviewing for a job or trying to sell a book manuscript—but it seemed odd not to attend when the largest meeting of my (sort-of) profession was being held in my own backyard. I had intended to work Friday morning, then head to the conference in the afternoon and be there through the weekend (the meeting didn’t end until this afternoon, but I had to work today). However, some extenuating circumstances kept me in Philadelphia for an extra day, so I didn’t make it to the AHA until late Saturday morning (and missed the bloggers/#twitterstorians gathering on Friday night, my only regret about my delayed arrival). So what do you do at an AHA when you’re no longer an academic? (I guess that’s the way to describe me … still working on figuring that out.) Well, you spend a lot of time explaining to people what your job is, watching as confusion passes over their faces until you utter the magic words “Ping-Pong Diplomacy” and they finally have something to grab onto. Aside from that, my weekend was mostly about buying books and meeting/catching up with people. I did go to two panels—one on education overseas, one on the future of the book review—but I’ve long felt that panels are the weakest part of conferences. Some are good; most are formulaic at best. I usually wind up feeling that my time could be better spent elsewhere. Therefore, after arriving and getting my meeting badge on Saturday morning, I made a beeline for the book exhibit. After my first pass through, I actually didn’t think I would buy that much. I got a lot of books at last year’s AHA and still haven’t read most of them; why would I add to my pile of unread volumes? But the trade publishers who take booths at the conference know how to get me—paperbacks $3-5, hardcovers $10—and by Sunday afternoon, I had acquired ten new books to be read (two of which were free!). 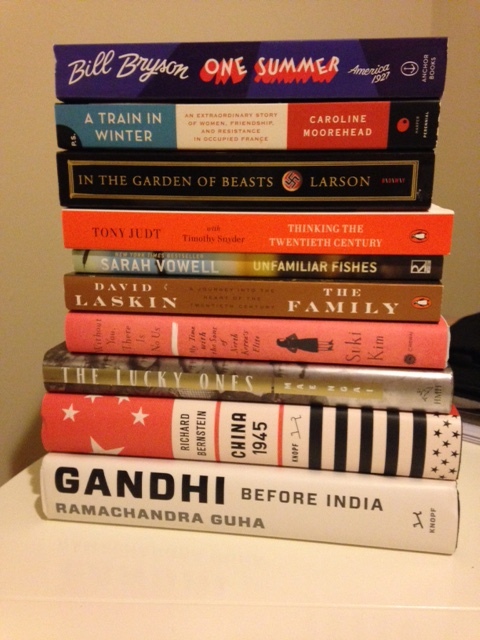 The knowledge that I would have to carry everything home on the subway definitely kept my purchasing in check. The AHA is huge—the sessions were split across two hotels in Midtown—and there were still lots of New Year’s tourists hanging around the hotels, too. In other words, you couldn’t count on running into people you hoped to see. If I’d planned better ahead of time, I would have emailed people and set up meetings, but … that didn’t happen, for the most part. Twitter actually turned out to be my main medium for connecting with others at the conference: in a couple of cases, I realized from reading tweets that I was sitting in the same panel as someone I wanted to say hi to, and in other cases, I used Twitter direct messages to make plans with people whose email addresses and phone numbers I didn’t have on hand. The American Historical Association itself uses social media and technology more effectively than most other professional organizations, and that emphasis on connectivity can really enhance the conference in ways that I don’t think people always realize. Overall, I’d say I just dipped my toe in the AHA this year. Only being there for parts of two days meant that it was difficult to get fully engaged in what was going on, and I definitely didn’t do a good enough job ahead of time arranging to meet with people. I also found that having the conference in your home city is not the greatest: rather than spending full days at the meeting and then heading upstairs to collapse in my hotel room and watch HGTV at night, I was acutely conscious of all the stuff I had to do at home (laundry, dishes, work) and made relatively early exits on both days. An intermittent weekend subway/PATH train schedule made the trip between Jersey City and 53rd Street about an hour long each way, which ate up time as well (though I got to read a lot!). Spending money on the conference hotel when I have an apartment a few miles away goes against my nature, but if I had been more involved in the conference, or more interested in being involved, staying onsite would have probably made sense. Though it was pretty nice to come home at the end of the day and fall asleep in my own bed … even without HGTV to amuse me.